What better way to finish race week on a high than a boogie at your favourite local? And have we got a treat in store for you with exmouth faves; Kickback. 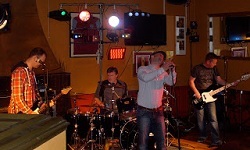 This local four piece band always go down a storm playing a diverse array of music covering classic and more recent rock and pop songs. They’ve got a little something to suit everyone’s taste and are guaranteed to get you up on the dance floor, or at least heavily tapping your toes under the table. So, if you are in the mood for a boogie or just want to kickback and enjoy some great music with these cheeky chaps come along from 9.00.